For more than a quarter century, Keystone Answering Service has proudly provided premier-quality, cost-effective telephone answering services using state-of-the-art technology. Our specially-trained, dedicated team connects clients and businesses across the United States from three Call Center locations: the Keystone home office in Newtown, Pennsylvania; Allentown, Pennsylvania; and Leola, Pennsylvania. Since our inception in Levittown, Pennsylvania, in 1987 to today, we constantly seek opportunities to provide the highest-quality, most efficient, and cost-effective telephone answering services. These are the hallmarks by which we will always serve our clients. Innovation and technology are keystones of our operation from the beginning. In fact, our company was founded, in part, to take advantage of the efficiencies gained by operating paperless, computerized messaging. Across more than two decades of service, Keystone Answering Service, formerly MedCom Professional Services, has offered cutting-edge technology for client ease and convenience. It’s a marvel how our services have progressed from one-way, alphanumeric paging in the mid-1980’s to today’s two-way, secure SMS and secure text messaging to mobile devices! Over the years, in our pursuit of excellence in customer service and satisfaction, Keystone has achieved several noteworthy industry milestones. 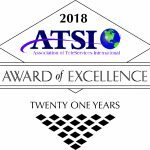 With over 1500 telephone answering services in the United States, Keystone is one of only four services in the country to earn the coveted ATSI Award of Excellence for eighteen consecutive years. In recent years, Keystone’s achieved three top scores and three top ten scores in the ATSI and CAM-X Award of Excellence programs. Click here to learn more about our awards and certifications. It is our privilege to serve clients in a variety of industries, to offer the best telephone answering system technology, to provide quality, innovative products and services for every client. Contact us today at (800) 777-8047 to learn more about how Keystone can enhance your business. © 2016 Keystone Answering Service. All rights reserved.